President Donald Trump delivers his State of the Union address before a joint session of Congress. 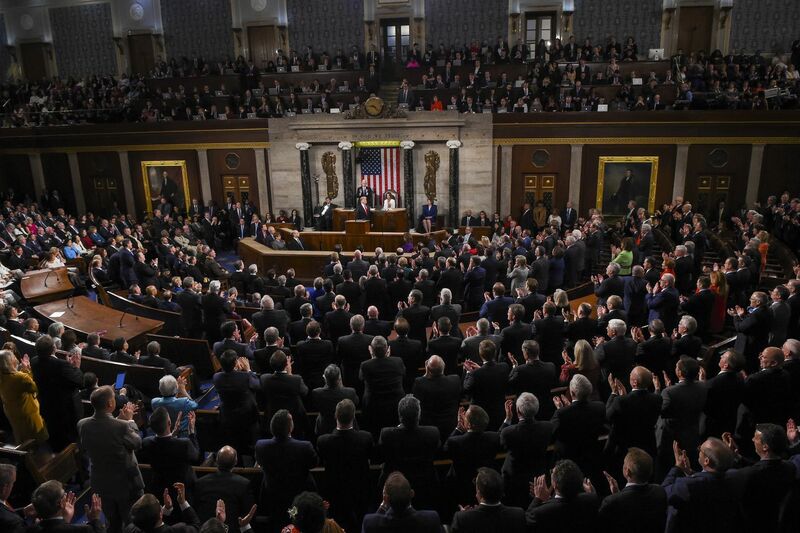 On Tuesday night, President Donald Trump delivered his second State of the Union address to both chambers of Congress. Trump covered a lot of policy issues in the speech — immigration, AIDS, abortion, the economy, trade, foreign policy, paid family leave, child cancer, school choice. But the lead-up to the address was touted as being a bid for unity in a deeply partisan country, and there wasn’t much in Trump’s language to build bridges. More critically, the absence of three of the biggest crises that we face as a nation — climate change, gun violence, and the opioid epidemic — represented a lost opportunity for the president to create a sense of shared battle. The State of the Union came a week after Director of National Intelligence Dan Coates presented the yearly worldwide threat assessment to the Senate Select Committee on Intelligence. In the assessment, Coates writes that climate change is going to "fuel competition for resources, economic distress, and social discontent through 2019 and beyond.” Coates' assessment is consistent with a UN report from October that found that extreme weather events are becoming more frequent and more intense due to climate change and without significant change, a humanitarian disaster could unfold as early as 2030. The human toll of climate change also comes with a dollar amount. According to the 2018 National Climate Assessment, the cost of extreme events since 1980 for the United States was $1.1 trillion. Also missing from the address was any plan to address the rising toll of gun violence. According to the Centers for Disease Control and Prevention, close to 40,000 people died of gun related injuries in 2017 — the last year that data are available. The United States is the home of about half of all civilian-owned firearms in the world. According to the Naval Postgraduate School, which has collected data on school shootings since 1970, there were 97 school shootings in 2018 — more than any other year. On top of the loss of life, the disabilities, and the trauma that gun violence causes, it also impacts communities as a whole. An Urban Institute study found that fewer gun-related incidents are related to more economic activity in a neighborhood. The opioid epidemic was mentioned in a list of bipartisan victories of the Trump administration — but that’s it. That is problematic. While the commitment of $3.3 billion in funding in the last budget toward prevention and treatment of addiction is important, we are far from declaring victory over the overdose crisis. More than 70,000 people died of an overdose in 2017, according to the CDC. First estimates of 2018 suggest that overdose deaths are leveling off. Still, that means that for a third year in a row, more people died of an overdose in the U.S. than all American fatalities in the Vietnam War. There is a common theme among climate change, gun violence, and overdose deaths: They are all preventable and man-made. These are also issues that all Americans should fight against shoulder to shoulder, regardless of party affiliation or political leaning. But that won’t be possible if they aren’t a part of the agenda.